The momentum behind mobile payments is picking up as we kick off a big year in mobile wallets, but many of the newest challengers in the space are going to have to overcome one nagging reality: consumers still trust their banks and credit card companies to drive the mobile payments market. That’s according to some new data from a couple of different surveys from KPMG and mobile analyst Chetan Sharma. This doesn’t mean that efforts like Google Wallet (s goog), Square, Isis or PayPal (s ebay) will struggle or fail. Most of them are aligned with credit card companies and banks already. But from a consumer perspective, the embrace of mobile payments appears to be easier when its led by a known financial institution, like a bank or a credit card company. In KPMG’s 5th Annual Global Consumer & Convergence Survey, the firm found that 56 percent of consumers said they trusted their financial services institution most to handle their mobile commerce financial data. Only 7 percent trusted retailers and 6 percent said they trusted their mobile/Internet service providers. Secure payment start-ups like PayPal fared better with 30 percent saying they trust them with their information. The preference for financial institutions may come down to the fact that consumers are increasingly wary about data privacy and security when it comes to mobile transactions. KPMG found that the percentage of people worried about these concerns has gone from 75 percent in the previous survey to 90 percent now. 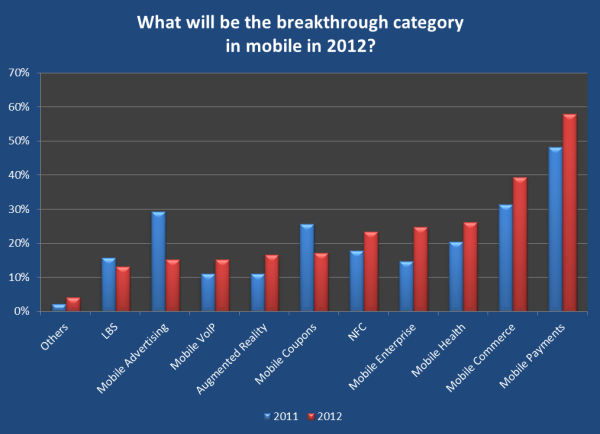 Sharma found some similar results when surveying 150 industry insiders for his 2012 mobile predictions. He found that respondents believed financial players were most likely to define the mobile payments and commerce space, with some 37 percent voting that way, up from a little more than 31 percent in 2011. Meanwhile, operators, Google and PayPal were well behind with respondents expressing less confidence in their ability to define the payment market in 2012 compared to last year. Start-ups as a group got more backing from respondents in 2012 while Amazon (s amzn) and Apple (s aapl) showed up on the charts for the first time this year. I am astonished when I see that data privacy and security is not only the most critical issue among consumers worldwide, but that year-over-year those concerns increase. This is a key issue that should have been addressed by now. Whoever can master the privacy challenge will gain a significant competitive edge. Consumers themselves point to the potential solutions with 76 percent citing better disclosure of security measures taken and 72 percent wanting to see third-party audits/certifications. 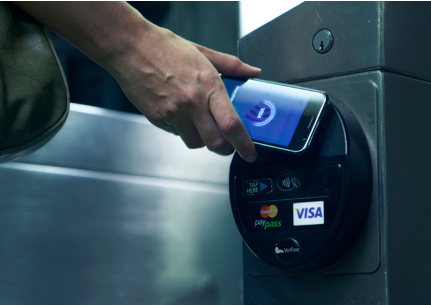 That’s why it’s important to watch what happens to the banks in the big NFC payment systems. They could be a big help in speeding adoption of certain platforms if they put their weight behind specific payment tools. Or they could be in a position to drive things themselves if they roll out their own advanced digital wallets. Also, keep an eye out on Visa (s v) with its V.me wallet and American Express (s axp) with Serve, which could become popular tools this year. All of these entities enjoy strong financial relationships with consumers, who when confronted with a lot of noise this coming year, may find comfort in familiar names. Whoever can address these trust concerns can look forward to a big opportunity. KPMG found that 2/3 of respondents are ready to use their mobile phone as a wallet, up from 2008 when half said they were uncomfortable with mobile banking. 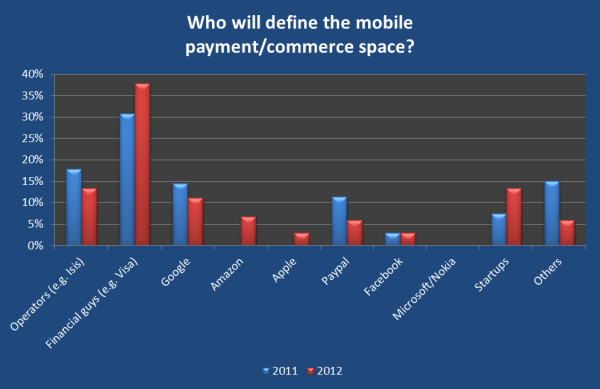 Sharma found that his insiders believed that mobile payments will be the breakthrough category in 2012 and payments and commerce will be the most popular consumer application in 2012. This coming year won’t necessarily be the big year (subscription required) that everyone is hoping in mobile payments but it will be pivotal in helping introduce many of these services to consumers for the first time. And those with the most appealing and secure story will have a jump on the competition. Thanks for a good piece Ryan. I certainly agree that the market is getting hotter. And when viewed across an international perspective you also have folks like mPowa (www.mPowa.me) – a very Square-like service – coming out of Europe to compete on the world stage. I used a Skype type competitor called Fring recently and while the calling technology was far from perfect they had the ability to transfer credit to another Fring user. If Skype implemented that I would certainly use it. I’m * very* surprised Isis lost share of mind yr over yr. Their selection of Gemalto is security-solid and they are coming out with a solution that runs across all major credit providers and all major carriers (Sprint being a work around, but still possible). I expect an announcement about the first issuer (i.e., financial partner/bank, like Chase or B of A) to be imminent. Happy that our backyard, Austin, is among the pilot markets – looking forward to testing out…watch for first-person reports from the field!